The diesel rebate was designed to protect local industries against international competition (where primary farmers enjoy protection), as well as to provide relief to consumers who do not necessarily use roads. Depending on the industry, the rebate provides full or partial relief from the fuel levy and the Road Accident Fund levy. Agriculture receives about 40% relief from the fuel levy and 100% from the Road Accident Fund levy. The diesel rebate is currently R2,83 per litre. A farmer qualifies for 80% of his lawful use (i.e. 80% of the qualifying litres). How does one qualify for the diesel rebate? To qualify for the diesel rebate, a farmer must be registered for VAT and for the diesel rebate in terms of the Customs and Excise Act. To qualify for the rebate and to be able to claim it back, a farmer must be able to prove and calculate the amount of lawful consumption in terms of Schedule 6 to the Customs and Excise Act. This schedule lists the activities that qualify for the rebate, as well as how diesel usage must be recorded. The rebate is regarded as a ‘provisional concession’ until the farmer can prove reasonably that the diesel was used lawfully. In addition to the fact that farmers must provide proof of diesel purchases, they must also be able to indicate how the diesel was consumed. Claim the rebate on the basis of diesel already consumed, and not on the basis of purchases. Date on which the diesel was dispensed. Reason for which diesel was used. Note: Experience with audits has shown that SARS can also ask a farmer to indicate where on the farm the activity takes place. Do not use ‘general’ as an activity – rather specify according to the qualifying activities in Schedule 6. Please note that the final logbook and guide still have to come from SARS. The above information may therefore change. 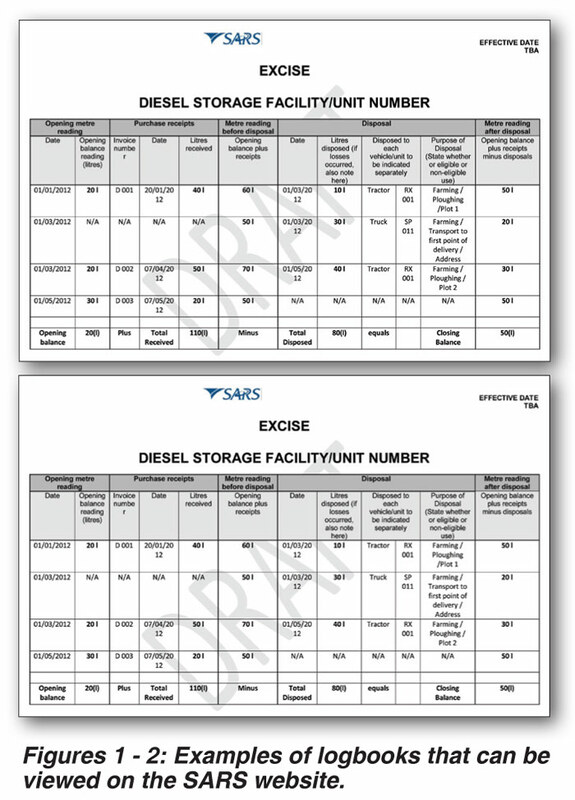 For more information on managing the diesel rebate and the qualifying activities, refer to the Customs and Excise Act (Schedule 6, part 3): http://www.sars.gov.za/AllDocs/LegalDoclib/SCEA1964/LAPD-LPrim-Tariff-2012-19%20-%20Schedule%20No%206.pdf. Activities that qualify will be limited to purely primary production. It has been proposed that all transport activities from the farm and any processing activities whatsoever be excluded. A further proposal is that qualifying primary production be linked to a physical point where such activities will take place. Persons involved in qualifying primary production activities can claim repayment for diesel used in these activities, provided that a proper logbook be kept that is linked to the physical site where such qualifying primary production takes place. Claims will only be allowed with respect to diesel used in the qualifying primary production activities, and the current 80:20 percentage allocation that applies to qualifying repayments for agriculture at present will then fall away. That means that farmers can claim 100% of their qualifying usage under the new dispensation. A separate diesel repayment administration, unconnected to the VAT system, has been proposed. The restrictions with respect to proposed beneficiaries who cannot claim diesel repayments because they are not registered for VAT will therefore fall away. The diesel rebate is one of the only benefits received from the government and the system must therefore always be above suspicion. Should members experience problems with their rebate or its implementation, they may contact Grain SA. Article submitted by Corné Louw, Grain SA Senior Economist. For more information, send and email to corne@grainsa.co.za.